Irishmen were overheard talking about "bangs" hours before bombs blew up in two Birmingham pubs, killing 21 and injuring 220, an inquest jury heard. Witness Norman Catton thought they were referring to the bombings in Guildford nearly two months earlier, in 1974. But Mr Catton later realised they were talking about explosions yet to take place and tried to alert police. But he struggled to get officers to take any interest, the Birmingham hearing was told. Written evidence from Mr Catton, who died last year, was presented to the hearing at the city's civil justice centre. "I became concerned they were planning to cause some bombs to go off," he said. Mr Catton had then become so alarmed he drove to a nearby police training college to report what he had heard. But he said he struggled to get officers to take an interest and by the time he eventually persuaded two officers to return to the pub with him, the men had gone. The bombs went off about eight hours later in the Mulberry Bush and Tavern in the Town pubs, on 21 November 1974. "I was devastated," Mr Catton's statement continued. "I was angry that nothing had been done. "I have been haunted by the role I played in it and I feel guilty every day. I wish I could have done something to prevent it. "I wonder whether it might have been prevented if I had convinced the police." 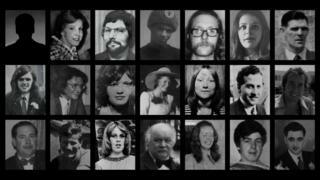 The Irish Republican Army (IRA) is believed to have carried out the bombings, although no-one has ever claimed responsibility.